Maybe that's not really a confession as much as a frustration that's been running through my mind over and over again these last few days...weeks even. Creating recipes? Check! Photographing them and editing? Check check! Sitting at the computer with pictures uploaded and a blank white screen staring at me with that darned flashing cursor? That's where the fun begins. I'm going to blame it on a friend. Can I do that? Sure, why not. It all started when we were sitting chatting about life one Sunday evening right after our bible study had finished. He so lovingly and curiously asked, "How do you come up with all that stuff to write about each day?!" I laughed and said something (pretty quickly might I add- no thought needed) to the effect of, "Pretty easy actually. I have so much to say always and enjoy sharing stories about what's going on in my head/world. I usually talk about life, fun things that excite me, Jesus, or just the recipe itself." "Oh. Cool." I kid not, from that day on...each and every time I sit at my desk to compose the meat of the blog post...I fall completely and utterly short for words! That's not me! So not me. But alas- it has hit me...HARD. I literally can not come up with a single thing to say. Nothing seems interesting anymore. My life's whatevers, my love of Twilight, my cats...the confession that my husband and I are on some weird Robert Redford kick right now and are currently watching more movies he's done than I care to admit (up next, The Natural)- it's like I think to say something and then stop myself with a, "Who cares"... So lame. Now, in all honesty it is NOT this friend's fault. He actually was really interested in the whole blogging thing and admired me for being able to do it full time and as long as I have been. Said he didn't think it would be something he could just do over and over. So what happened? Honestly, I have a sneaking suspicion it has something to do with life's bigger deals going on right now. The hurricane and "Super Storm" that just happened, the freaking ElEcTiOn we just went through, friends and their battles with cancer, my own issues, etc etc. My head isn't in the fluffiness of stuff, but rather sort of anchored to land and really trying to digest and process all that's going on right now. There's a lot going on. So glad the election is over. Sheesh. Hoping to feel safe enough to sign back on to Facebook (seriously, things were getting NASTYYYYY there) and rekindle with friends and family that live so far from us. It truly got to the point my husband and I just couldn't even bare to look for a second- there was so much slandering/bad mouthing/fighting/boasting going on. Not just about the presidential election either- we're talking down to the props and measures. If anyone dared to share which way they were thinking of going- they were attacked like pigeons to a piece of cake. Crazy crazy. 6. Prayer will still work - it will still make a difference and God will still answer. 10. God will still be with us always - He will never leave us or forsake us. Anyway, this writer's block stinks. Always has and I'm sure always will. BUUUUT thank goodness the baking/cooking/photographing part of my brain never ceased. Phew! So, because I couldn't think of what to write- for the life of me- I literally have 30 recipes sitting on my computer, most completely edited and waiting to be written about. I've cleaned out my cupboards. I've vacuumed my house- twice. I've sorted and resorted files on my computer. I crocheted a Christmas present AND a scarf (for myself). I read ALL my coffee table magazines. I started a new devotional time routine (and love it). I literally have done anything and everything I could possibly think of in order to stay away from that blank white screen. Alas, I can't bare it any longer. It's time to man up...err woman up? and take control of my wandering brain and unsupportive "Who cares" thoughts. Wow...I guess my writer's block is over, eh? Let's make sweet potato pie! Now I'm a lover of pumpkin pie as much as the next guy. Don't get me wrong in that department. BUT when it comes to SWEET POTATO PIE- I freaking LOVE IT! LOVE SWEET POTATO PIE! It's creamy. It's silky. It's sweet and sweet potato-y. 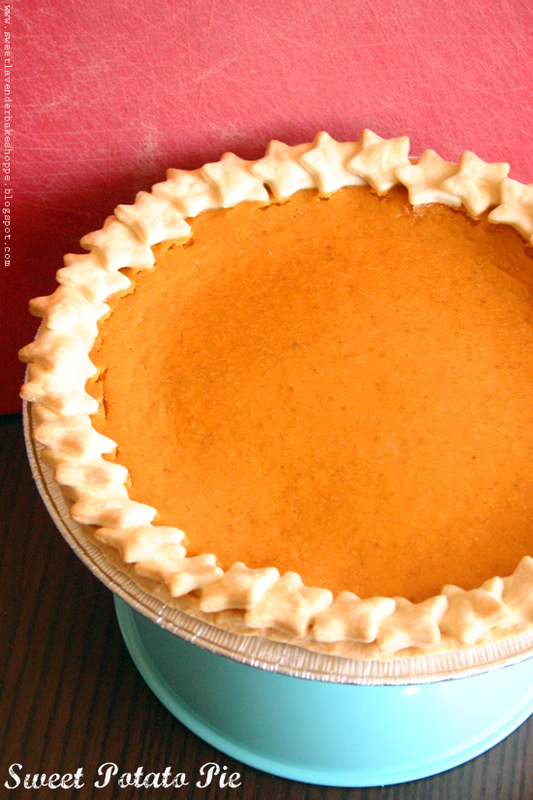 It's a perfect pumpkin pie alternative (if you're into that sort of thing. I'm not. I say have both. Eat both. Rinse and repeat.) It's great at Thanksgiving. It's fabulous at Christmas. You can literally make it all year long (sweet potatoes are ALWAYS in the market...as opposed to fresh pumpkin- or canned for that matter). Make basic pie crust. Form into a 9" pie dish. Set into fridge while you make filling. Or if you've bought prepared unbaked pie crust, make according to manufacturer's directions and set into fridge. Into your food processor, add your eggs, evaporated milk, lemon juice, vanilla, salt, nutmeg, allspice, cinnamon, and cardamom. Puree together until completely smooth. Pour filling into unbaked crust; smooth top with a spatula. Transfer pie to a wire rack to cool completely, about 2 hours. This pie can be baked up to a day ahead and covered and refrigerated overnight. Serve chilled or at room temperature...and with lots of sweetened whipped cream! **Pie can also be baked in advance, cooled as directions instruct, then wrapped well with plastic and then tin foil. Place in freezer for up to a week! Then defrost overnight in fridge! Ahh writer's block... So glad you've passed! Get ready for many new posts all about cats and Twilight. You've been warned. BY THE WAY! Instagram changed? Added a new web profile? Don't ask me why, I have no clue. To be perfectly honest- it looks just like Facebook (cue sad trumpet sound). Anywho, if you're interested, here is my Instagram profile. For your viewing pleasure. Again- cats and Twilight. You've been doubly warned. I'm thrilled to have found your blog! Your creations are beautiful, I'm anxious to try some of your recipes!